Botak Chin, real name Wong Swee Chin, was one of Malaysia’s most wanted criminals. His first taste of the underworld was when he joined Gang 306, participating in his first armed robbery in April 19, 1969. He was caught once and sentenced to seven years in jail after committing eight robberies. When he got out, he did try to make a decent living as a vegetable trader but found the earnings to be pitiful. He eventually went on to form his own gang with Ng Cheng Wong, Beh Kok Chin and Teh Bok Lay — robbing banks, running illegal gambling dens and initiating gang wars (with the Lima Jari Gunung gang). It all went downhill for Botak Chin when they tried to assassinate assistant police commissioner S. Kulasingam, and failed. His attempt spurred the formation of The Dirty Dozen: 12 policemen who established a force to specifically capture Botak Chin. This lead to his arrest in February 1976 after a shoot-out where he was shot six times but survived. 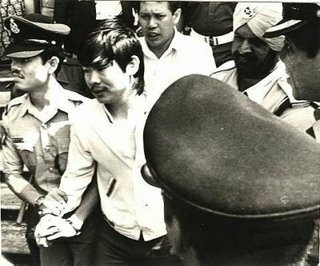 Thrown into Pudu Jail under the Internal Security Act, he attempted escape in 1981 but failed. He was finally hung to death on 11 June 1981.